Start Kitesurfing the safe and fun way, and get all the skills you need, faster! Your first day Kiteboarding is one of the most important in your Kiteboarding career. Many newcomers will decide on this day whether this is the right sport for them or not. Much depends on the experiences that you will have in the first few hours or even minutes. 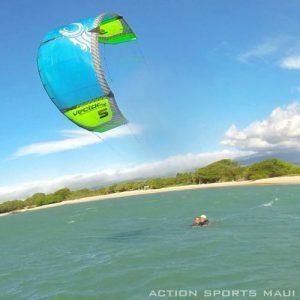 At Action Sports Maui we know how important your first day is, and we do our very best to give you a safe, fun and empowering experience. Everybody is different: Kiteboarding combines two skill sets, “Kite Flying”, and “Board Riding”. Some student kiteboarders will have some of these skills from other sports like wakeboarding or flying kites as a kid. There are paragliders, pilots, windsurfers and other sportsmen that will have some background experiences to draw from. 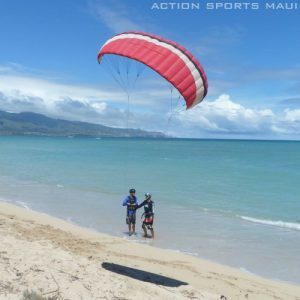 However there is also a growing number of people who have never done another water sport or board sport, whom are learning Kiteboarding as their first board-sport. 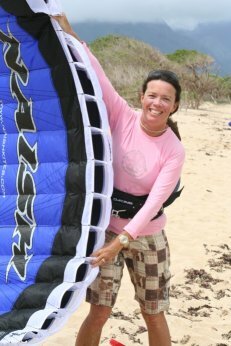 What to Expect: In your first lesson you will learn many of the core skills that are essential to Kiteboarding. 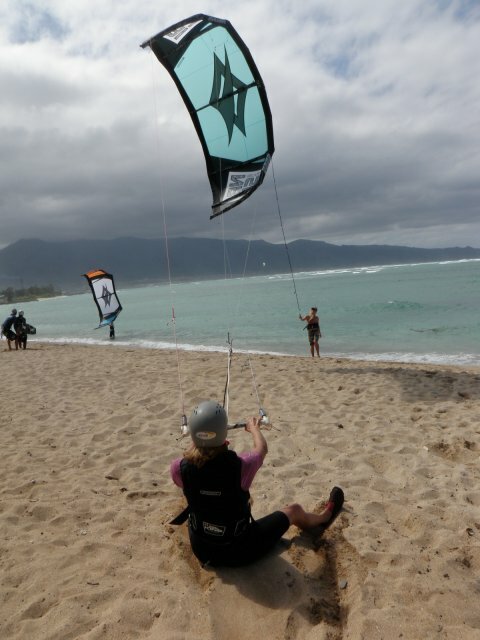 There is a complete list of the kiteboarding skills on our IKO Levels page. Check it out to get an idea of what is in store for you. This skills are laid out in a practical sequence to allow you to build up to more complex tasks. The average sports person may learn to be an independent kiteboarder in 10 hours of lessons and a non-sportsmen may need 15-20 hours to become an independent kiteboarder. There is no need to do it all at once. You can learn the sport one day at a time, and build up your skills and experiences, until you feel comfortable and confident to go on your own. Evaluation: When we begin the lesson your instructor will ask you about your previous experiences, sports background and water confidence. This is the best time to tell them if you have any reservations, fears or lack of water confidence. Also tell them if you have had some kite flying experience before. Example; a lesson from a friend, or a “professional lesson in Mexico a few years ago”. This is all helpful information to the instructor that allows them to better tailor the lesson to you. Your Own Pace: By pacing the lesson to the student’s learning speed we ensure that they stay in control, and learn the skills at the appropriate time. You will not be put in a situation where you will get blown away or not know how to get your self back to shore. Similarly if you are a fast learner, your instructor will be able to feed the techniques to you as quickly as you can absorb them. You are not held back by being put in a group situation with slower learners. Step by Step: Every part of the kiteboarding process is broken down into simple exercises that are quickly learned, When we start to combine the exercises we will have the basics to learn the essential skills. We start at the beginning with the CORE SKILLS. The core skills include: Stopping the kite, steering the kite, & self-rescue. These skills give the student the confidence to take on the next set of more challenging tasks. Control then power: We teach the students to have control, before we give them power. We maintain a high level of safety during the lesson by maintaining control. We will ensure that the students master the skills before moving onto a new task. Seeing is believing, so when we can see the student demonstrate the skill we can move forward. We do not pressure the students to progress at any particular pace. Just as quickly as they can naturally and comfortably learn. We repeat each exercise several times to ensure the student has good mastery of the skill and will retain the information. Once a student has completed the basics, we can add some more power to use. Equipment: We provide all the equipment that you will need during your lessons. We only use the latest and best quality gear available. Quality means reliability and this often leads to improvements in safety. Every year we thoroughly test and evaluate all of the major brands. 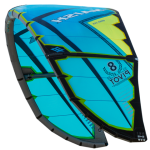 We have had the most success working with Naish Kiteboarding for over 17 years, the quality of the Naish product makes it a world leader in the Kiteboarding industry, and they are the longest running kiteboarding kite manufacturer in the world. STEP ONE: Kite Skills. We start with the trainer kite on land to teach you the steering reflexes that are so important to successful kite-flying. The trainer kite is smaller than the full size kite you will be using in the next steps. The trainer kite allows you to experiment with the wind and get the feel for the kite. During this process you will also learn about wind direction, flying in the wind window, using power-zones, using the harness and using the other safety systems. STEP TWO: We move onto the larger inflatable kite. The inflatable kites are what we use in the water because they float and are able to be relaunched. You will discover how to handle the kite and use the depower system, and steer one handed. We show the correct way to set up the equipment and how to use the various safety systems. Moving from the land to the water you will learn how to launch the kite safely. STEP THREE: We then learn to fly the kite on the water without the board. 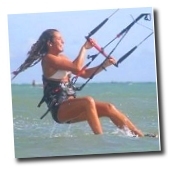 We start with some body surfing behind the kite, and use kite power to return to the beach and to provide locomotion. This is also called “body dragging”. You will fly away from shore, and surf a downwind course and return to the beach and self-exit. Next you learn to steer the kite “single-handed” while using the harness. STEP FOUR: Board Skills. You will learn how to launch with the board, and how to recover the board in deep water. You will learn board handling skills, and the Theory of the waterstart. 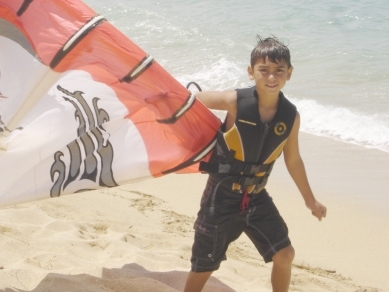 The waterstart combines the board skills with the kite-flying skills. As you gain experience using the board and kite together you will begin to pop up on the board and start to ride a short distance. After your lesson you will decide if you are ready to upgrade to one of our longer courses, or whether you just want to let all the information sink in for a while. You will receive an IKO Certification Card that outlines your progress and shows you where you are on the learning curve. This will enable you to judge how many lessons you may need to achieve your goals. If you are leaving our shores. you can take the card with you to any one of hundreds of IKO certified schools around the world, and continue your training where you left off. Your card is a record of your skills and can be used to prove your competency when renting equipment or when riding at a location that requires proof of ability.